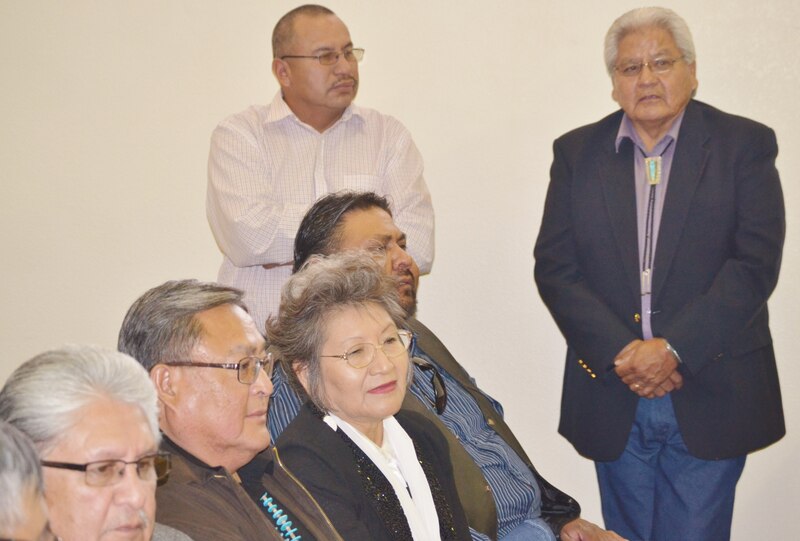 The Navajo Nation Supreme Court has been asked to hold 11 Navajo Nation Council delegates in contempt of court for voting for the nullification of the 2014 Navajo Nation Primary Election for the presidential race so a new June 2015 Primary Election for the presidency and a special August 2015 General Election for the presidency can be hold. The contempt of court petition, which was filed at 4:42 p.m. today, Jan. 12, 2015, also asks the tribal Supreme Court to hold the 11 delegates in contempt for voting for the pardon of the Navajo Nation Election Board. Navajo Election Administration Director Edison Wauneka is also named in the petition, which was filed on behalf of former Navajo Nation presidential candidates Dale Tsosie and Hank Whitethorne by private attorneys David Jordan of Gallup, N.M., and Justin Jones of Farmington, N.M. The 11 delegates are Mel R. Begay, Lorenzo Curley, Jonathan Hale, Leonard Haskie, Walter Phelps, Danny Simpson, Roscoe Smith, Duane Tsinigine, Roland Tso, Leonard Tsosie, and Edmund Yazzie. But Wauneka and the election office have not printed ballots, have not announced an election date before the Jan. 31 deadline, and have not taken the necessary steps to ensure compliance with the Supreme Court’s Dec. 17, 2014, order, Tsosie and Whitethorne stated. Tsosie and Whitethorne noted that on Jan. 10, 2015, President Ben Shelly “purported” to sign CD-80-14 into law. Shelly also appears to have signed CD-81-14 into law on Jan. 10, 2015, they added. “Because the Council is openly and notoriously seeking to defy and undermine the orders of this Court, those delegates voting for the two resolutions should be held in contempt, Tsosie and Whitethorne stated. The two former presidential candidates are also asking the Supreme Court to “immediately” schedule a hearing, order Wauneka and the 11 delegates to be present at the contempt hearing, hold Waunke and the 11 delegates in contempt and remove Wauneka and the five re-elected Delegates, Begay, Hale, Phelps, Tsosie and Yazzie, from office, declare resolutions CD-80-14 and CD-81-14 to be “null and void”, and order Navajo Nation Controller Mark Grant and an “appropriate person” from the Navajo Nation Office of Management and Budget to appear before the Supreme Court to discuss the financing of the special presidential election. Tsosie and Whitethorne also asked the high court to reaffirm their Jan. 31, 2015, special presidential election deadline and to order Wauneka and the 11 delegates to pay all legal fees and costs for their attorneys, Jordan and Jones. Delegates Begay, Hale, Phelps, Tsosie and Yazzie will be inaugurated into office tomorrow, Jan. 13. The inauguration begins at 10 a.m. at the Window Rock High School sports center in Fort Defiance, Ariz. After the inauguration, the Council is holding a special session at 3 p.m. at the Council chambers in Window Rock, Ariz. This entry was posted in News Articles, Professional Journal and tagged Chris Deschene, contempt of court, Edison Wauneka, Navajo, Navajo Board of Election Suprevisors, Navajo Election Administration, Navajo Nation Council, Navajo Nation Supreme Court by Marley Shebala. Bookmark the permalink.